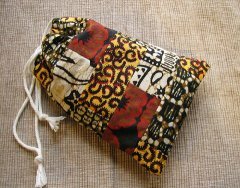 So, I’ve finally decided to learn how to sew properly, with an eye to creating some tarot bags for myself that incorporate all of the features that I really like in a bag. 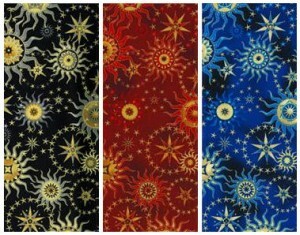 In my previous post about my favourite bag creators, I mentioned a really nice Stargazers fabric that I kept seeing everywhere. I’ve since learned that it is a Robert Kaufman fabric that comes in the black and blue that I’ve already seen, but also in red. The black version in particular is striking in person. Robert Kaufman Fabrics makes or imports some other really nice fabrics, including a large range of hand-dyed, artisan batik fabrics from Lunn Studios. 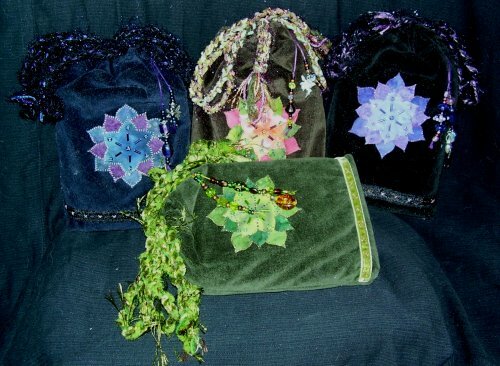 I became interested in batik fabrics after seeing the fabrics used by Kerri Walters (Little Moon Originals) for the mandalas on her tarot bags, and Robert Kaufman’s batiks are gorgeous examples of the art. 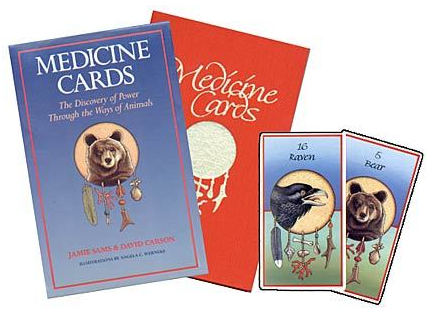 The deck was created by Jamie Sams and David Carson, illustrated by Angela Werneke, and published by Bear & Company (now a part of Inner Traditions). Originally published as a 44-animal deck in 1988, the deck was re-released by St. Martin’s Press in 1999 with an additional 8 animal cards. As far as I can tell, there are really only three basic packages in which the cards were sold to consumers: the original 44-animal deck with companion book; the 44-animal pocket deck with no book; and the revised and expanded 52-animal deck with companion book. Each of those versions may have had many re-printings and editions in which the book or deck may have changed slightly, but essentially those three versions seem to be it. Package details: The cards and book came in a cardboard slipcase that features the image from the Bear card. Deck consisted of 44 animal cards, 9 blank shield cards, and a title card, for a total of 54 cards. The version I have has a notice that the cards were “printed in Canada by International Playing Card Company”. The slipcase also has a sticker that indicates that over 600,000 copies were in print at the time. Package details: Cards come in a small tuck box. Each card of this deck features the name of the animal and a small image of Angela Werneke’s artwork above text describing the meaning of the card. Presumably it was intended to be used on its own, without a companion book, much like the Wolf Pack Tarot. This deck also includes one blank shield card titled “Unlimited Potential” that appears to have a different purpose than the nine unnamed, blank shield cards included with the original and expanded decks — the blank cards in those decks exist so that you can create your own extra animal cards; the “Unlimited Potential” card has its own meaning and, as a result, doesn’t really appear to be usable for an additional animal. Package details: I haven’t seen a copy in person, but judging by the pictures, it comes in a slipcase similar to the original version, though with Eagle on the cover instead of Bear. Deck consists of 52 animal cards, 9 blank shield cards, and a title card, for a total of 62 cards. The new deck contains eight additional animals: Blue Heron, Raccoon, Prairie Dog, Wild Boar, Salmon, Alligator, Jaguar, and Black Panther. It also includes the same nine blank shield cards that the original deck did (so that you can create cards for any additional animals that aren’t already included) and the companion book. There is also supposedly a US Games version, published perhaps in 1997 that I haven’t seen but I believe is essentially the same as the St. Martin’s Press version. I’m addicted to tarot bags. If I could sew, I’d probably start making my own. But since I can’t, I have to rely on others to create what I can’t. I haven’t yet found The Perfect Bag™, but I’m definitely giving it the old college try. I’ve discovered a few things about my preferences as my bag collection grows. I’ve discovered that I don’t like duplicate bags — I only have (and want) one of any size/pattern/colour/style bag; I prefer padding, coordinated linings, and double drawstrings; I really love charms, beads, and other dangling doodads on bags and drawstrings, provided they are well considered and securely attached (some of the early bags I got were factory-made and the beads fall off at the least provocation); and I prefer patterns rather than pictures. Even though I’m constantly on the lookout for new bags, I do have some favourite bag makers that I keep going back to whenever the urge hits. Nancy Towne makes lined and unlined bags in a variety of sizes from a wide range of interesting cotton fabrics. 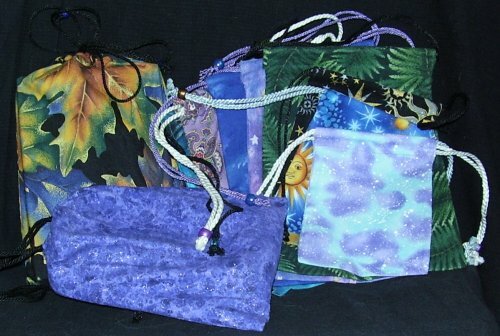 My favourites are the lined, double-drawstring tarot bags, which are approximately 5″ X 7″, large enough to hold the Tree Affirmation Cards deck and book without the box (that’s what’s in the autumn leaves bag on the left). They are very simple bags, but are extremely solidly crafted. And some of the fabrics she finds are among my favourite fabric patterns of all-time. 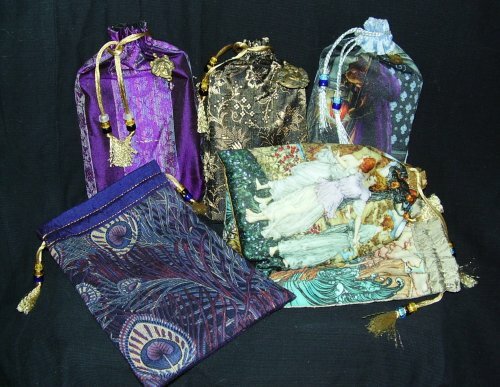 (The sparkly purple bag on its side at the front, which contains a matching tarot spread cloth, is a particular favourite.) Her bags feature side seams so prints that have a up side and a down side (like animal images) are going to be upside down on one side of the bag, but that only detracts slightly from those bags. 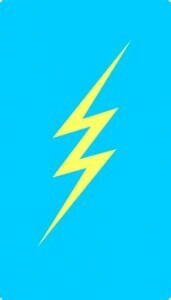 She also offers free shipping if you buy $25 or more worth of stuff, which is very easy to do. (I just bought a number of bags from her and I could easily find another batch to order.) And she ships really quickly. You can probably find other lined bags elsewhere for $5 or less but they tend to be factory-made and I doubt they’re as well-made as these. This is the brainchild of Karen Mahony and Alex Ukolov at Magic Realist Press in Prague. My addiction to Baba Studio bags began when I bought the Baroque Bohemian Cats Tarot gold edition from them last year. With the gold edition, you could buy a special bag that featured your choice of card image, a special cat charm, and metallic cording for the drawstrings. It was so beautiful that it hooked me on Baba Studio/Magic Realist Press in general and on their bags specifically. I’ve wanted to buy additional bags featuring images of their BBC and Bohemian Gothic tarots for ages, but instead I’ve been sidetracked by their Art Nouveau prints (some based on vintage Liberty of London prints) and the bags featuring gorgeous paintings by Arthur Rackham and John William Waterhouse. The bags are impeccably crafted, the silk fabrics they use are sumptuous, and the print images are gorgeous. The only minor annoyance for me personally is the tag sewn into the bottom of the lining, but it’s easily cut off without damaging the bag itself. Years ago, my sister dragged me to a tattoo parlour, to keep her company while she got a tattoo of a rose above, I think, her left breast. It’s a nice tattoo. Watching her get it done was both entertaining and a little horrifying. Pain. I get it. She was going to pay for me to get a tattoo as well, but I was on blood thinners at the time. So I got a rain check. I’ve been thinking more of getting a tattoo lately but I couldn’t decide what I wanted done. Or where I wanted it done. I thought about getting a spider and a Web (representing the interconnectedness of everything) — a realistic one — but then thought about the potential for really freaky hallucinations in the future. A stylized spider doesn’t thrill me as much. Spent months browsing through tattoo artist flash sites. Nothing jumped out. I think I know what I’d like to get now, though I still don’t know where I’d put it. The Ace of Cups from the Deviant Moon Tarot. I’m absolutely in love with it, with the colours in particular, but also with the art. I’m not at the point where I’m quite ready (or can afford) to get the tattoo, but when I am, that’s at the top of the list of choices. The idea of using a tarot image never occurred to me until I was browsing Enchanted Oracle artist Jessica Galbreth’s site. She allows her work to be used for tattoos for a small fee, which I thought was very cool. I’m hoping Patrick is as well. So, here are my questions to you. Would you consider getting (or do you have) a tarot-themed tattoo? If so, what would (or did) you pick and why? Changed over to a theme that includes some of the features that were missing from the old butterfly theme. Also added a custom graphic and am slowly fine-tuning the colours and layout in the style sheet. The picture at the top of the blog is my cat, Mots. He’s an Aquarius and not too interested in tarot, except to lie on the cards when I’m trying to read them. The picture (in a slightly different form) used to be on my personal blog, but I seem to be abandoning that blog completely so I’ve moved the graphic here. It seems more happy here, in any case. Card Kitten is powered by	WordPress 4.9.10 and delivered to you in 0.551 seconds using 42 queries.